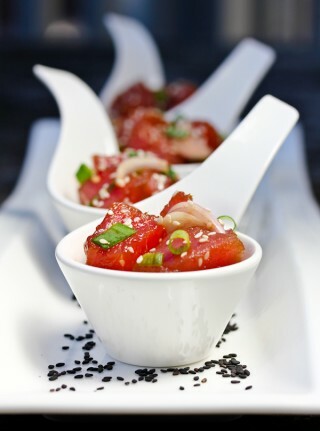 Pat the Ahi tuna dry, then neatly cut it into small 1/2 inch cubes. Place in a bowl. Add the shallots, green onion, soy sauce, sesame oil, chili garlic sauce, and sesame seeds.Gently toss. Serve immediately or cover and refrigerate. *For another variation, omit the chili sauce and add 1/2 teaspoon wasabi paste and 1 teaspoon honey. You can also add a fresh avocado if you so desire!